Bring 4 quarts water to a boil. Salt boiling water if desired and stir in rigatoni; return to boiling. Boil 12 to 14 minutes, stirring frequently, until al dente (firm, but tender). Drain. Meanwhile, blanch* broccoli florets in a medium size saucepan and remove with slotted spoon. Heat olive oil in a 4 quart frying pan. Saute the onion for 2 minutes. Add the garlic and pesto, stir for 1 minute. Stir in the tomatoes, Immediately remove pan from the heat. Add broccoli and chicken and stir to combine. 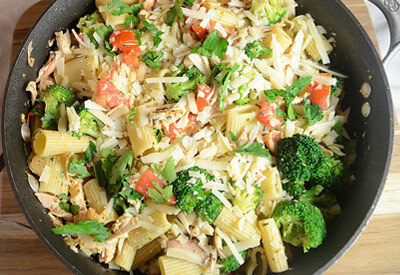 Add cooked pasta to chicken mixture and toss. Sprinkle with parmesan cheese, pepper, salt and parsley. Serve warm.